Horizon Books was established in 1961 and is still family owned and operated for nearly 50 years of bookselling in downtown Traverse City. In that time the bookseller has grown to three locations in Northern Michigan: retrofitting a JC Penney building in Traverse City, the Milliken’s department store in downtown Cadillac and doubling the size of its store in downtown Petoskey. All the stores have cozy fireplaces, coffee bars, loooong hours and are conveniently located downtown. Horizon Books was established in 1961 and is still family owned and operated for nearly 50 years of bookselling in downtown Traverse City. 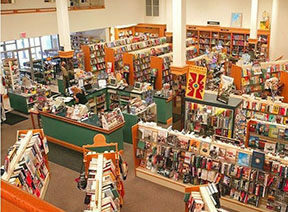 In that time the bookseller has grown to three locations in Northern Michigan: retrofitting a JC Penney building in Traverse City, the Milliken’s department store in downtown Cadillac and doubling the size of its store in downtown Petoskey. All the stores have cozy fireplaces, coffee bars, loooong hours and are conveniently located downtown.. Horizon Books view its job to say yes to what the Northern Michigan community wants in a bookstore – reading groups, music, helpful staff, convenient hours, support of local authors and a welcoming atmosphere. Horizon Books hopes you consider its stores to be your “third place,” the place you go to relax , the first being home, the second being work.